Caroline McIlroy was the overall winner at Sunday's Trapline Marathon in Labrador, completing the picturesque 42.2 kilometer course in 2:57:29. Harry Borlase was 2nd overall and 1st place male in 3:15:51. In the Half Marathon event it was Nikolay Ryabkov in 1:24:13 for 1st place male and overall, and Richelle Weeks 1st place female in 1:34:40. 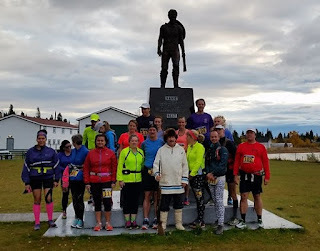 The race also featured 10k and youth 5k events with Stephen Pike (M 38:30) and Deanna Lushman (F 47:49) winning the 10k, and Matthew Cornect (M 21:03) and Claire Kean (F 23:01) winning the 5k. All results are posted HERE.